In early 2017, the Highlights team had our first ever in-person interview with authors of this January’s Editor’s pick. For this historic event, we met with Gabriel A. Devenyi and Jamie Near, researchers at the Douglas Mental Health University Institute in Montreal, and authors of the recent MRM article “Advanced Processing and Simulation of MRS Data Using the FID Appliance (FID-A)—An Open Source, MATLAB-Based Toolkit”. It was noon on Friday, and we decided to get an early start on the weekend by heading to a most Canadian interview location – a skating rink at Beaver Lake in Montreal. 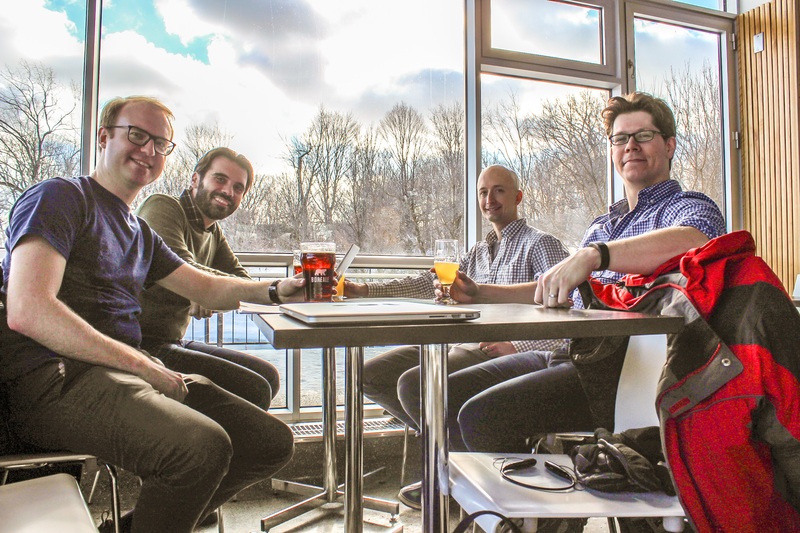 Over beer and bison hamburgers, we discussed spectroscopy, open science, and the musical inspiration behind the acronym FID-A. MRMH: Tell us a bit about yourself and your background. Jamie: I am assistant professor at the department of psychiatry at McGill, with an affiliation with the biomedical engineering department as well. My background is in physics and engineering and my research focuses on developing methods for MR spectroscopy (MRS) of the brain, both in humans and in animals. I did my undergrad at Queen’s University in engineering physics, my PhD in biophysics at the Robarts institute (University of Western Ontario), and my postdoc at the FMRIB Centre in Oxford. Gabriel: I am a research computing engineer at the Douglas Institute. I did my undergrad in Engineering Physics at McMaster University, where I stayed on to do my PhD in semiconductor physics, nanocrystals and electro-optics. I then had a lateral shift into computing as a Software Carpentry volunteer, and that is how I heard about a software opportunity at the Douglas. Now I support both computing and open science work at the Douglas Institute, where I work with Jamie and others to contribute open-source software to the community. Jamie: Gabriel encourages everyone in our lab to do open science related things. MRMH: Talking about open science, could you talk a little bit about your research and the FID-A? Jamie: I wrote the actual code of the software during my postdoc at the FMRIB in 2010 or around that time. It was already known that MRS preprocessing could improve our data, but there was no publicly available software to read and process data in its original RAW format. So, I wrote my own software using MATLAB to have access to averages, coil channels, and sub-spectra. At the same time, Peter Jezzard and I co-supervised a Master’s student, Robin Simpson, and he wrote some nice code for NMR simulation in MATLAB, which is the basis of the simulation part of this toolkit. Even though Robin only worked on it for four months, he made a lasting contribution. I have used that code for many years, but it was only two years ago that Gabriel encouraged me to make this publicly available and open source. Back then I didn’t even know what Github was! Highlights team members, Benjamin and Nikola, chat with Jamie and Gabriel over a cold drink at Beaver Lake in Montreal, Canada. MRMH: What are the main functionalities of FID-A? Jamie: The software itself is composed of three parts: the first part is the processing toolkit, including frequency drift, phase drift correction, removal of motion corrupted averages, filtering, eddy current correction, etc. The main feature is it is designed for raw data, whereas most other tools are for data that’s already been averaged. The second part is the simulation toolkit, for doing density matrix simulation for in vivo spectroscopy data to predict what the spectra would look like. And then there is the RF pulse toolkit to analyze RF pulse shapes. By the way, the name “FID-A” is actually a tribute to the excellent Radiohead album, Kid A! MRMH: That’s awesome. How many people are using the software now? Do you have statistics about that? Jamie: About 100 visitors on Github every two weeks currently, which is quite a lot considering the small community. Gabriel: Since I started working on open-source software, this has been our most downloaded work, and seems like it will be my most cited paper. As an aside, open science projects tend to have higher citation rates, something I’ve lectured on before at the Douglas. 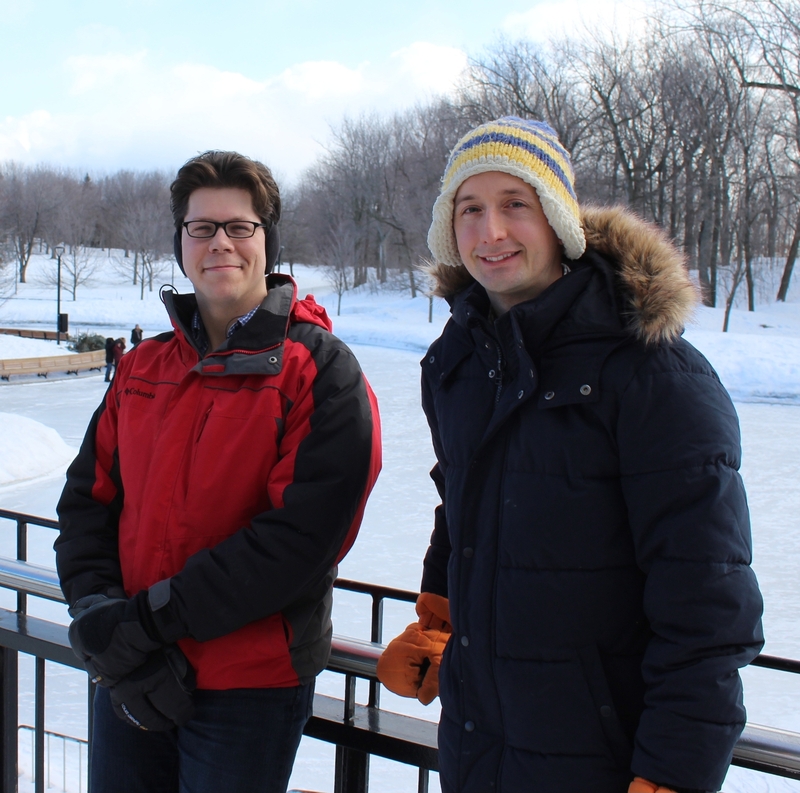 Jamie and Gabriel have become adept at coding during the icy Canadian winters. MRMH: What kind of challenges did you face when releasing FID-A? Gabriel: The big challenge with releasing open-source software is writing enough documentation for a typical user. As somebody who knows the software well, I have lots of blind spots, meaning I don’t know what other people don’t know. MRMH: How do you ensure that the software keeps its accuracy and reproducibility? Jamie: For simulation, there are good ways of testing accuracy, such as acquiring phantom data and comparing it to your simulations. At some point, we did find discrepancies between GABA simulations and phantom results. The problem was actually with the published chemical shift and coupling values for the GABA spin system, and this led to a paper to update those literature values. Gabriel: Going forward with the reproducibility, we are looking at implementing continuous integration with Travis and Github. So we are planning unit tests for this code, to make sure it is consistent with previous results. If there are discrepancies we will investigate carefully. MRMH: Why did you choose MATLAB for an open-science project? Gabriel: MATLAB is most commonly taught in engineering classes, so it makes sense that an engineer would choose it first. There are also many tools in the neuroscience community that are written in MATLAB, so we can benefit from that. Going forward we want to test compatibility with Octave, the main challenge being the graphical interface. However, if I am writing a software from scratch, I would usually use another language, such as Python. MRMH: Do you recommend labs to openly release their software and research? Jamie: Yes, definitely. It’s a great way to maximize the wider impact of the code you write, and to improve the replicability of research between sites. I should mention that even this software benefited from scientists sharing and being open about their work. Although they are not co-authors on the paper, this toolkit contains contributions from lots of other people, including as Philipp Ehses, Martyn Klassen, Richard Edden, Ashley Harris, Kimberly Chan, and Saad Jbabdi. Thanks to all of them!